Excitement! January 20, 2015 I finished the blog about The Broken Church dream from May 12, 1989. I very hesitantly sent an email announcement to a few close friends. I don’t know why I hesitate…fear is the only reason I know. January 21, 2015 I had two dreams indicative of life and rebirth. I am so glad I have the Broken Church dream on record to remind me of my inner transformations. In my dream, I am entering an unknown, warm and friendly place. It seems like a church, but it has no walls. A young, dark-haired priest rushes by smiling at me and says something like, “I am not a very rule bound or rigid priest.” I smile back. “I am not a very often coming to church person, so we are even”. Mass begins. At the back, a lady is chatting away, very loudly. I mutter to myself and move around to the back. The church is a large circle and at the bottom right hand side there is plenty of room. Several small boys, age two or three, are happily playing, chattering. One mom comes. There is a lot of playing and chattering. The Mass finishes and everyone goes outside. The scene changes to a kind of picnic and now seems like Holy Rosary Church grounds where I grew up. I awaken feeling satisfied. As I remember the dream, celebrate! From intense fear of ridicule and despair to earth space with very little imposed constraint on my inner spiritual life. The importance of the two dreams seem self evident in light of The Broken Church dream of 26 years ago. It has been ruminating, digesting, for many years. In my dream, I am surprised to see several of my Black Angus cows coming up for water, with new born calves at foot! There are too many to count as they are milling about. I am elated! Early calves! All born with no help. They are several months early but all look healthy. I turn and head to the house to find Jason. He will be able to count them! I don’t actually see my house in the dream.When I get to the “house”, there are many people and several newborn babies. I go into what seems like a bedroom. My sister-in-law, Shirley is there with a little one on her knee. She motions “shh” with her finger to her lips. This small one, perhaps 10 months, has a cap on over her curly hair. She appears to have Downs Syndrome. The dream people seem like my family yet not. The scene changes to a run down garage at South Cooking Lake near the farm. A young man I neither see nor remember opens up a very very old garage door, the tin push up type. I leave via the open garage door. Next, I am back looking for the calves. I am very excited by the birth of so many calves on the same day, all healthy, all early! There is more in the dream. However, I have made the rookie mistake of not getting up to write it all down as soon as I awakened! My first impressions of the two dreams are clearly linked to the dream writing on the website. Those dreams from 1989 were just the beginning. Carl Jung was clear. Dreams are not like magic beans. Dreams are the inner work of individuation. The Church without walls feels beautiful, warm and lovely. It brings to mind my gardens on the farm. I find my gardens as my Earth Church. There are no limits, no walls in my Earth church. The children are truly much happier, chatty, laughing aspects of my self; they have all been birthed within since the dark days of depression I lived until the process of healing began in earnest in 1988. Dreams are my greatest gift. Images and figures in dreams are aspects of self. My inner priest has changed deeply as well. I am reminded of my experiences in New York studying with Father John Rich and Sister Sylvia in a Dream Intensive. I must find my writing from that Journal. During an intense inner experience, I was choking on a fish bone stuck sidewise in my throat. It came to me, it was the priest from St. Michael’s Parish in 1983. I went to receive the sacrament of Penance after several evenings of an Easter preparation series. My husband, Bill, had decided in the fall of 1983, that he would become a Catholic. The final stage of preparation was during Holy Week. Without going into all the details, I had confessed to the sin of despair. If you have never heard of this before, you are not alone. However, I was an inveterate reader from early childhood teaching myself to read long before I went to school. Not actually understanding a lot of the stuff I read! However, studying catechism as a child, I also read the Examination of Conscience as preparation for the sacrament of Penance. In my world of depression, I seriously misinterpreted the notion of despair. By definition, as an adult reader, I now know that despair in the Catholic teaching lexicon refers to complete abandonment of the hope of ever saving one’s soul. It is a positive act of will in which one gives up any hope of eternal life. It absolutely DOES NOT refer to anxiety and depression! I have labored under massively inappropriate delusions about the a”sin of despair” throughout those depression years. I remember reading that children are great observers and crappy interpreters. I have also studied much about memory. And our memories are sometimes notoriously inaccurate. I am thankful for the dream and the resultant search for the definition of despair. In any case, when I confessed to ‘despair’, rather than tell me what despair really meant, the priest rather dismissively said, “Get yourself to a good doctor.” I left in tears. I was 43 years old. Had been going to doctors since I was 6. What good had they done for me? In working with this dream of my Earth Church and Joyful Inner Priest, I come more to an appreciation of Jung. The process of individuation is indeed be a lifetime. The process of questioning your own interpretations of the world SHOULD go on for a lifetime!! Transformation in psychological processes is the work of a lifetime as one moves from child, to youth to young adult, midlife and crone stages. Each stage may be marked with ritual. In my view, our culture encourages resistance to the stages of life preferring instead to imagine never growing up as in the Pan of Peter Pan. Everlasting childhood. Everlastingly free of wrinkles! In these many years of dreams, I have moved through the seasons of birth, rebirth, heat of summer, autumn losses and winter deaths. In dream work, the symbolism of the birth of a baby has appeared often as I sought to undertake new projects and processes. In these two dreams both human and animal babies appear to mark a shift in my ongoing quest for wholeness. I choose to work with only a few symbols in this pair of dreams. Throughout the 26 years I have written dreams, cattle images have appeared often. Recently, a young friend showed me The Book of Symbols: Reflections on archetypal images. (See resources for the full description). I do several strategies with my dream images BEFORE consulting this or any other of several good reference books. I read easily 500 books on dreams in the last 25 years. 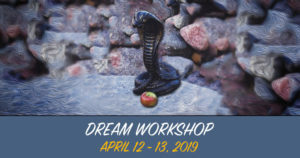 Sometimes, reading books like James Michener, The Source, Riane Eisler, The Chalice and the Blade and archaeological studies from Mirija Gimbutas lead to wonderfully beautiful and deep explanations of dream symbolism. Cows have always been a part of my life. Since Bill died, I have assumed full managerial responsibility for the herd. Records show 47 cow/calf pairs on the farm when Bill died. My son, Jason is my main consultant/assistant. He is definitely the muscle of the operation plus he has an amazing ability to remember each and every cow and its calf by name. So, Jason appears in the dream to assist me in figuring out the situation. Jason is a close aspect of my being. He represents a part of myself I know well. The Book of Symbols provides that the cow is the ultimate provider of riches.Her bull calves the workers of the fields, her manure fertilizer, fuel and building materials for houses. 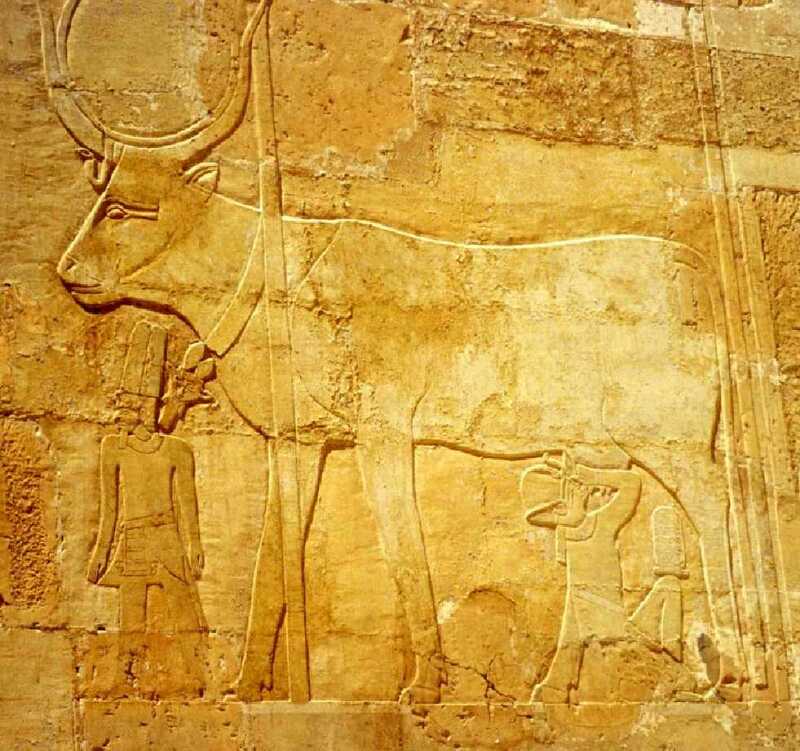 Like the Sacred White Buffalo of the Aboriginal Peoples, the Egyptian Goddess, Hathor, was there before the beginning of the world. The dream tells me that I am nourished from the Milky Way, the life-giving Cow on my way through death, birth and rebirth. Further, it may remind me that rumination, regurgitation of ideas, digesting leisurely, are important aspects of being. The cow dates back to the Rig Veda, one of the earliest Indian scriptures. There, to some extent, the cow is still worshiped. There is a good deal more in these two dreams separated only by a day and night. Inspiring! I am touched and moved by your ability to deepen distinctions in your dreams. The way you interpret dreams to better understand your life is truly a gift to everyone who is in contact with you. 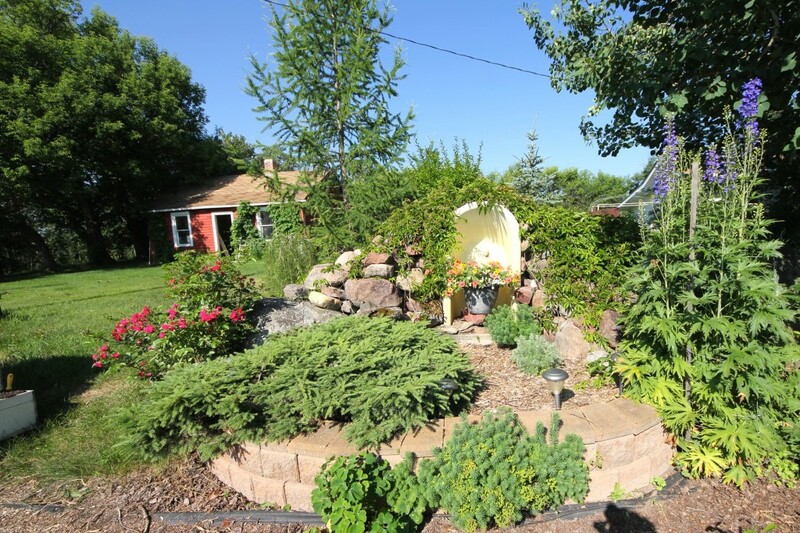 Your gardens as Earth Church! Wow! Thank you generously sharing your insights! thanks, Lucille,your gracious comments help me continue to work on these blogs! I guess I need validation! !